Glamping or glamorous camping is the best way to experience the great outdoors and escape the clamour of the city with your loved ones. With glamping, you are sure to get the best of both worlds as you do not have to worry about facilities and other necessary amenities, all while being surrounded by breath-taking nature. We have therefore come up with an exciting list that includes everything from yurts and safari tents, to glamping pods and tree houses, all to ensure you have the best glamping holidays in Europe. We start off the list with Camping Flims which as its name suggests, is located in Flims, Switzerland. The campsite offers alluring glamping pods that are nestled in the trees and mountains of Switzerland and are equipped with beds, heating, electricity, and even a charcoal barbecue. The glamping pods are also perfect if you are travelling with small children as you do not have to worry about the cold and other facilities that they would require. Quite the twist to regular camping! The camping site also provides fun activities that the entire family can partake in such as high ropes, mountain biking, hiking, a children’s playground and much more to make the perfect family holidays. Situated in the Tuscany region of Italy is Capalbio Village, a campsite that offers a true representation of glamping. The best part about it all is that the glamping tents are located right by the sea so you get to wake up to beautiful views of the beach every morning. The glamping safari tents have a lot to offer depending on which one you choose. Pick from fully furnished safari tents with a double bed, bathroom, fridge, microwave, and even a hydromassage shower. For the ultimate luxurious experience you can also opt for the exclusive safari tents which offer a jacuzzi. Glamping doesn’t get better than this! Another camping site that offers glamping with safari tents is Ferienparadies Natterer See which is located in Austria. As soon as you arrive at the campsite, you will be taken aback by the tents location as they are positioned amongst the woods of the Inn Valley in the Tyrolean Alps. The tents can accommodate from five to eight people which means that you can enjoy your family glamping holidays with entire family and friends in one tent. At Ferienparadies Natterer See you can enjoy a panoramic terrace with a fully equipped kitchen, a private toilet and rain shower, a dining area, heating, and of course comfortable beds. There is also a barbecue grill available so you can enjoy a warm and mellow day outside with your loved ones. Occasionally you can also enjoy live music acts by the lake and an array of international cuisine from the restaurant. Taking luxury glamping to the next level. Homoki Lodge which is located in Hungary offers its guests the perfect blend between comfort and luxury with their Homoki Yurts. The yurts are divided into three with a living, sleeping, and bathing area. Experience a glamping holiday that is fully air-conditioned with under-floor heating, a mini-bar, and complimentary tea and coffee. Other facilities include a jacuzzi bathtub and a bed that is positioned to let you watch the beautiful starry night sky. Children will never have a dull moment in the yurts as there is also a TV to keep the entertained. Once you experience glamping in the Homoki yurts, you will never want to partake in regular camping again! Choose from different fun activities offered by the lodge such as horse riding, archery, fat tire biking and much more. World's first glamping with six stars by World of Glamping brand! ⭐ At Garden Village Bled we aim to meeting criteria for uniqueness, concept, connection to history, architecture and sustainability. ⭐ Choose from 5 lodging types: Tree houses, Pier tents, Glamping tents, Tree tents & Studio apartment. ⭐ Eat in a restaurant through which flows a stream and grows grass on the tables. ⭐ Explore our natural biotope, freely harvest vegetables and fruit at our garden. ⭐ Experience little details: water ponds under tents, bird nests, wooden keys, marches to the wedding house and much more. ⭐ Welcome to make your memories with us! Share and tag us @gardenvillagebledresort . Have you ever experienced tenting among the treetops? Well Garden Village Bled which is located in the Slovenian resort town of Bled offers just that. The tree tents are every child’s dream as they get to sleep in a tree which gives them a magic experience. When you walk…or climb into the safari tent, you will be met with comfortable beds, a mini fridge, and a closet. Enjoy a bird’s eye view of the surrounding as you delight in a cup of tea or coffee in the morning. Garden Village Bled is perfect for family holidays as there are activities for both adults and children. Sign up for guided tours where you can discover the nature and history of the area with highlights such as the famous 11th Century Bled castle. Adults can also make use of the wellness area and enjoy a massage or sauna while the kids run around the playground. Interested in more glamping holidays? 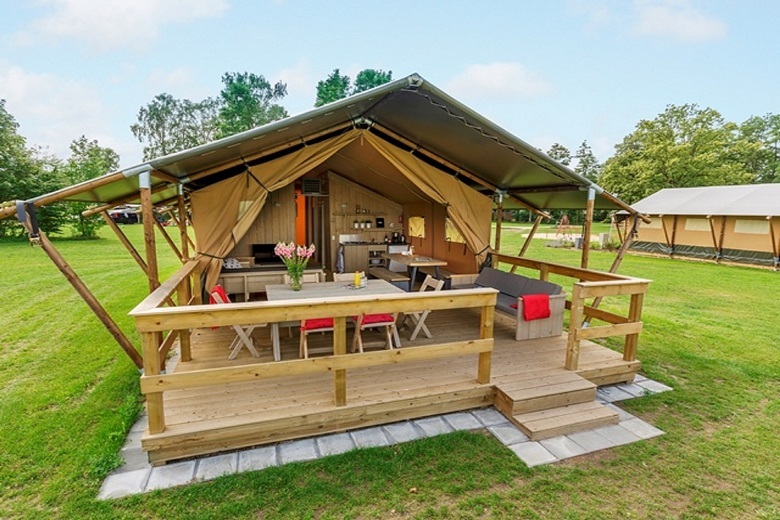 If you were intrigued by our list of glamping holidays in Europe, then why not have a look at our blog on the best glamping destinations in France. Choose from spectacular natural settings all over France for unforgettable family holidays.